Wild Olive Guesthouse is a beautiful, newly renovated colonial building. This stylish property offers clean and airy rooms, with an unbeatable location, so that your stay with us will be enjoyable and relaxing. 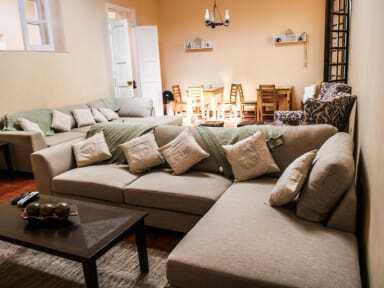 Wild Olive Guesthouse has a restaurant, bar, huge TV lounge room, Kitchen, and 8 rooms. We offer buggy tour and sandboarding adventures, local winery tours, and Ballestas Islands tours. 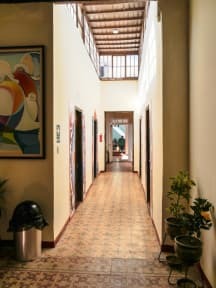 Wild Olive Guesthouse is located on the main boulevard in Huacachina next to the town library. We also have an entrance through the Main Road Perrotti street in front of Huacachinero Hotel. Huacachina is a small oasis town situated 10 minutes from Ica. It is an Oasis with a lagoon in the middle, palm trees, birdlife, and huge sand dunes. We have shared rooms only for girls, other shared rooms only for boys and we also have rooms mixed, all rooms shared have a lockers. And we have private rooms with bathroom. No 24-hour reception. Opening time is: from 8 am to 8 pm. Please advise your arrival time.